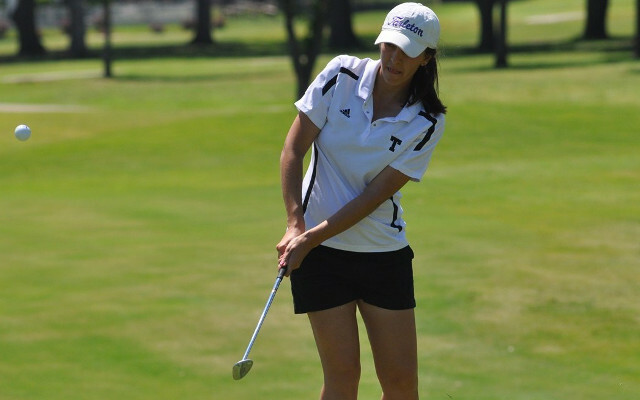 LAWTON, Okla. – The Tarleton State women’s golf team finished a stroke behind Newman to take second place in the Oklahoma Intercollegiate Golf Tournament at Fort Sill Golf Club. After finishing day one in a three-way tie for second place (299), Tarleton shot 294 on day two with Isabell Jimenez-Perea leading the way. She finished with a 71 on the day and 143 for the tournament tying for second-place individually at one-under par. Freshman Casey Wild started the day tied for 14th but, with a day two score of 75, swung herself into a tie for 10th place overall with a tournament score of 149. Beatriz Prados matched her day one score of 75 with another 75 on day two for a tournament score of 150 while Sarah Gee bettered her score by five strokes with a day two score of 73. Rounding out the field for Tarleton was Whitney Uselton, who posted a 79 on the second day to give Tarleton five performers under 80. Jimenez-Perea tied for a tournament lead in birdies (8), while Prados finished second in pars with 27. Jimenez-Perea’s performance this earned her a spot on the all-tournament team. This was the final fall tournament of the semester for the TexAnn golf team.